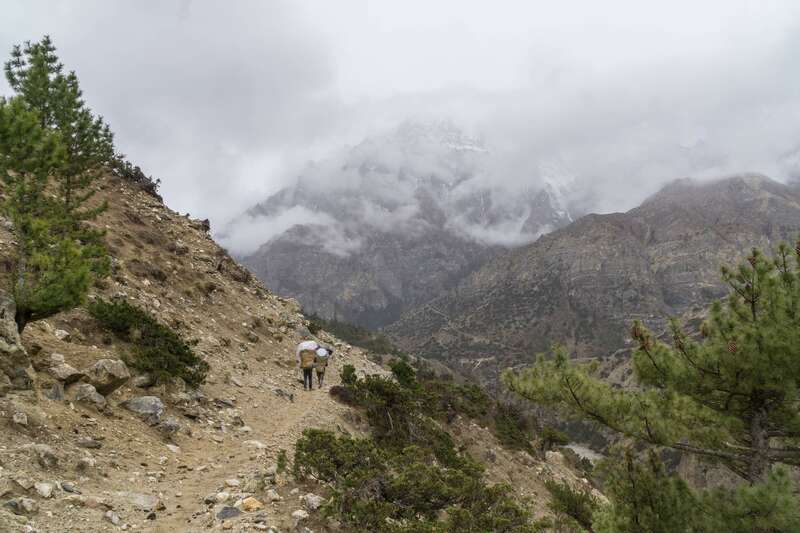 We set off for Meta at about 7:15; it was Day 2 or our three-day walk down the Phu/Naar Valley and marked by yet more altitude loss, even if not as dramatic as the 1000 meters we descended from Saribung La the day before from the moraine camp below Bhrikuti Shail. As we walked by the narrow channel the river has carved through the sandstone a similar view from Day 2 at the start of our trip came to mind. 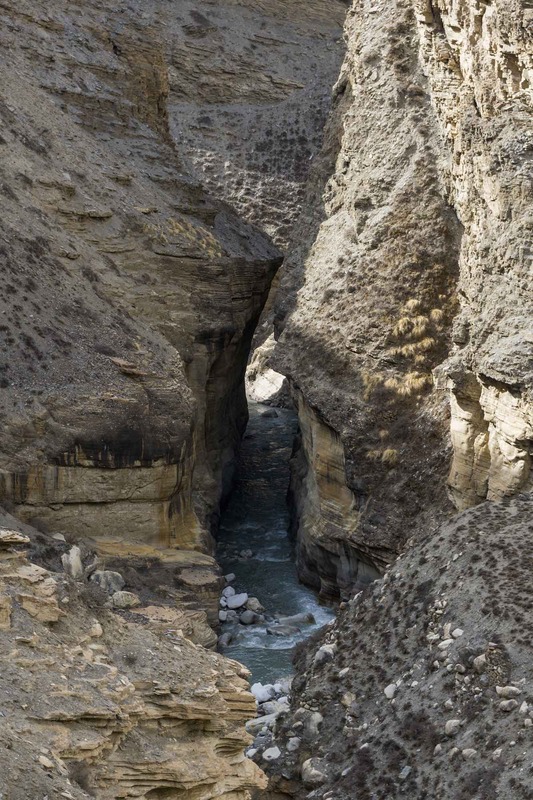 Two weeks before it was the Kali Gandaki carving its way through similar rock just before Chele. Then we had stood on the metal bridge and looked north into the passageway; now we were on a trail on river left as in the image below. Most of our walk down to Meta would be on river left with a few bridge crossings along the way, some simple wooden structures and others of metal. 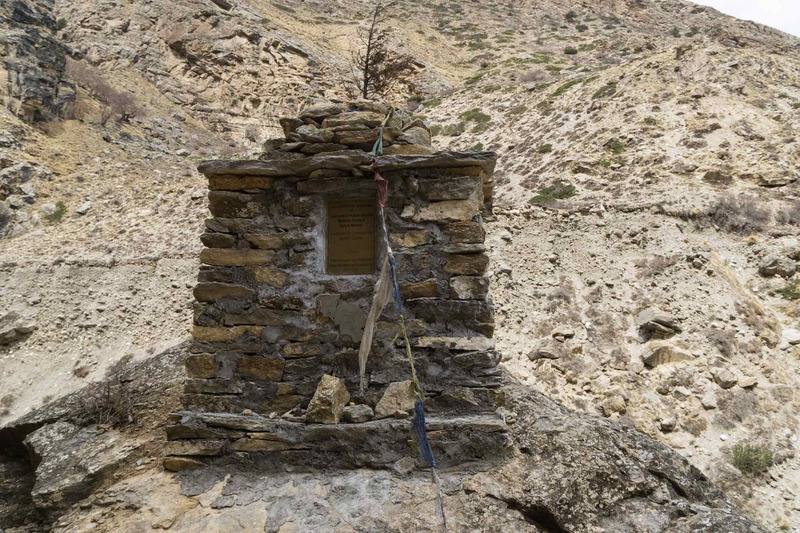 The trail itself was becoming more and more defined with an occasional chorten or a mani wall to remind us of the Tibetan Buddhist cultural world we were in. 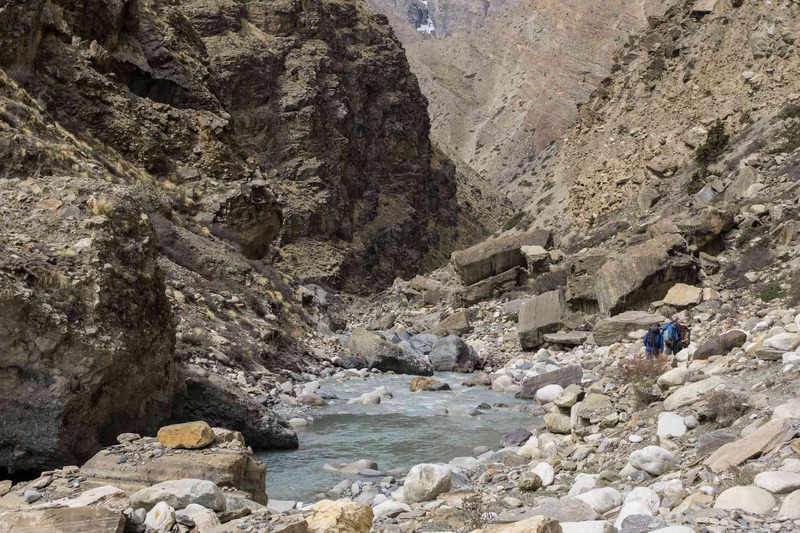 Just around the corner from the bridge, we are crossing in the image above we passed by what I understood to be a porters’ overnight stop. 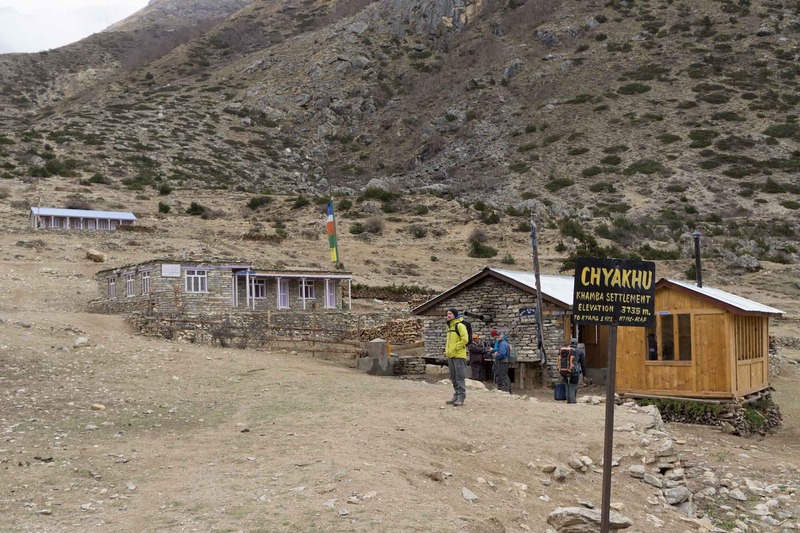 The rest house is about two hours south of Phu and could serve as a campsite if the lure of Phu did not provide the extra boost necessary to just finish off the walk that very day! 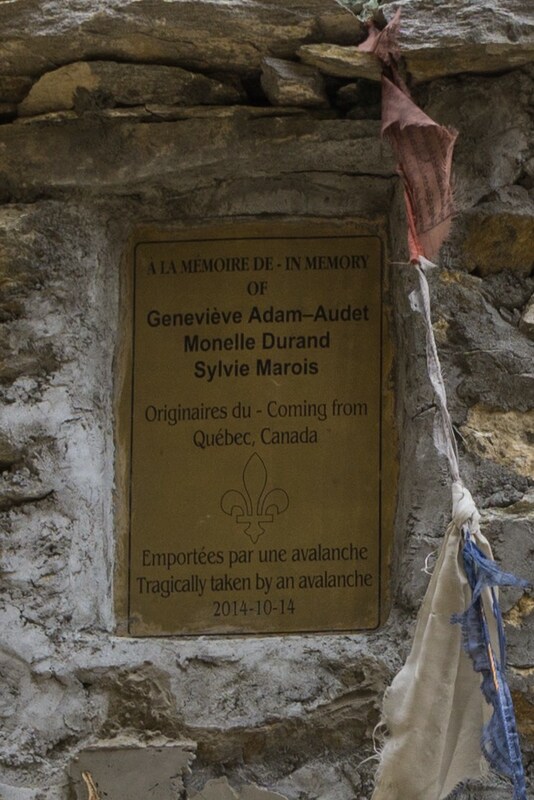 Less than a kilometer down from the stone building we passed by the memorial erected by the Quebec (a Canadian province) government in memory of three Quebec trekkers. 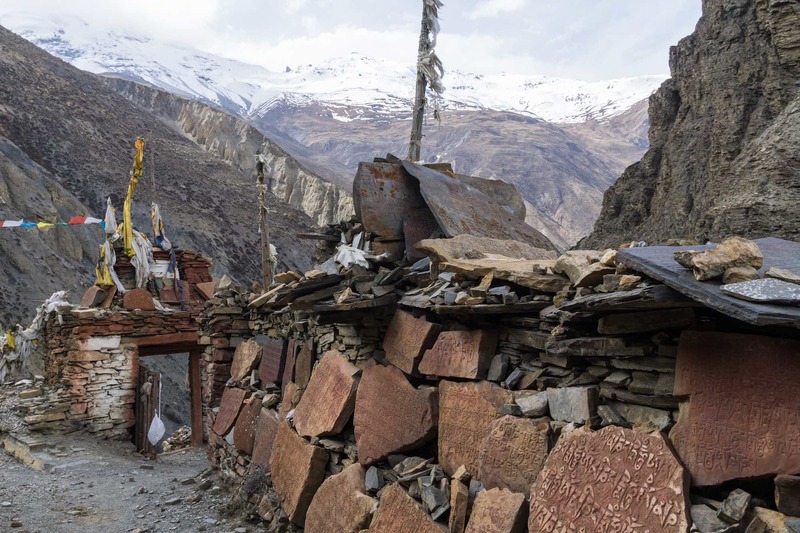 They died near this spot in October of 2014 when the torrential rains from Cyclone Hudhud triggered a massive snowstorm and a series of avalanches in the Manang district. 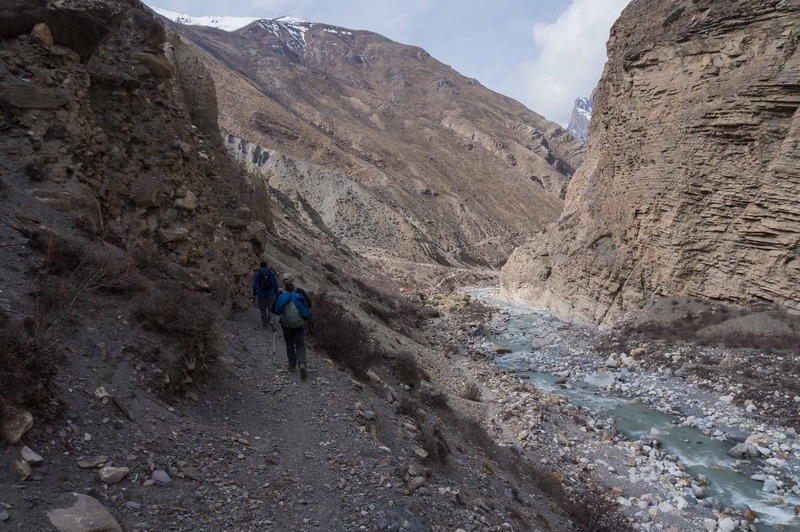 They were among the 21 trekkers and at least as many locals (guides, porters, yak herders) who lost their lives because of the storm. As I looked back at the cairn from a few meters down the trail, blending in with its surroundings and sitting on what appears to be a tilted pedestal. About an hour further down from the memorial we approached a grassy plateau on the trail pictured below. 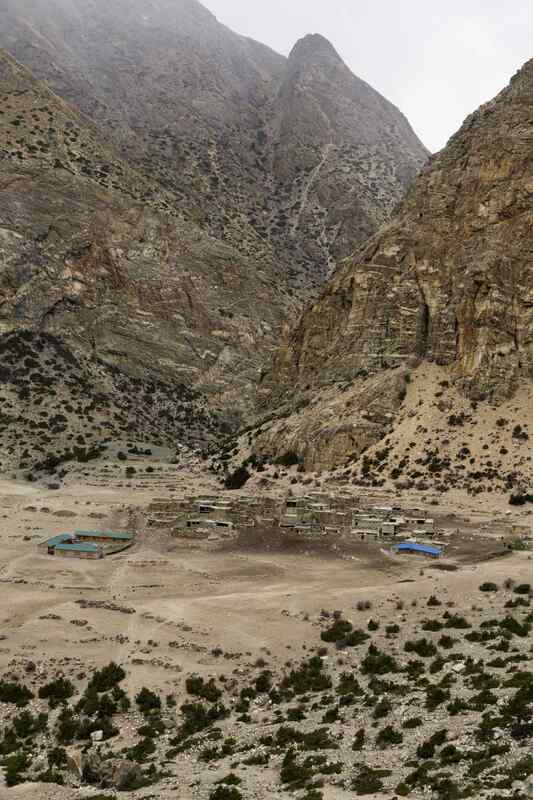 It was Khyang, for a brief period serving as a Khampa settlement. 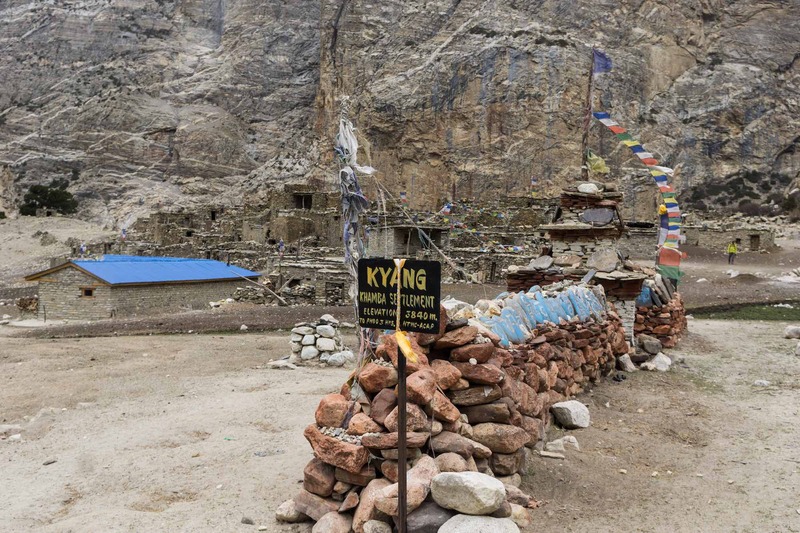 Khyang (one of many variations of the name including Kyang, Kyan, and Kya) was the first of a string of abandoned settlements which we would walk through on our way to Meta. 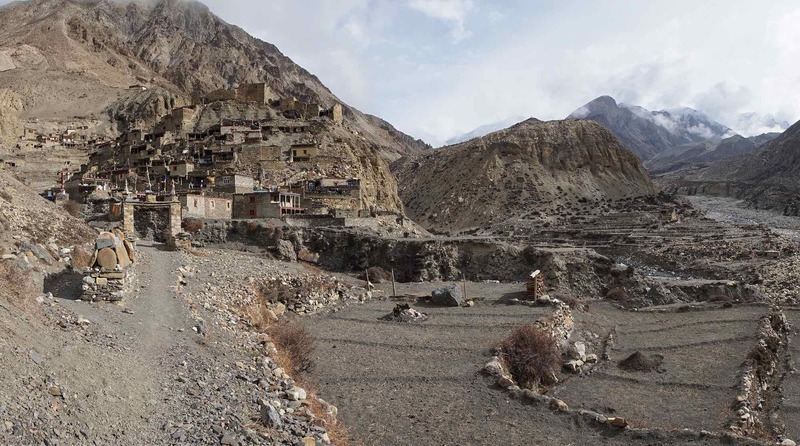 I had assumed that the inhabitants had left in the past twenty years or so as the depopulation of the Himalayan communities near the border with the new Chinese masters continues. 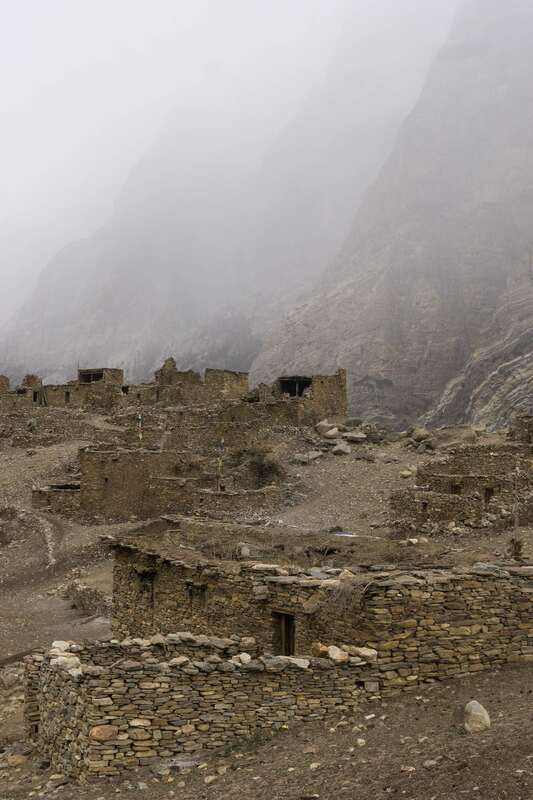 Their closing of the border had upended centuries of land use patterns and trade routes on which the communities on the Nepalese side had built their economies. There was, however, an added complication to the above. 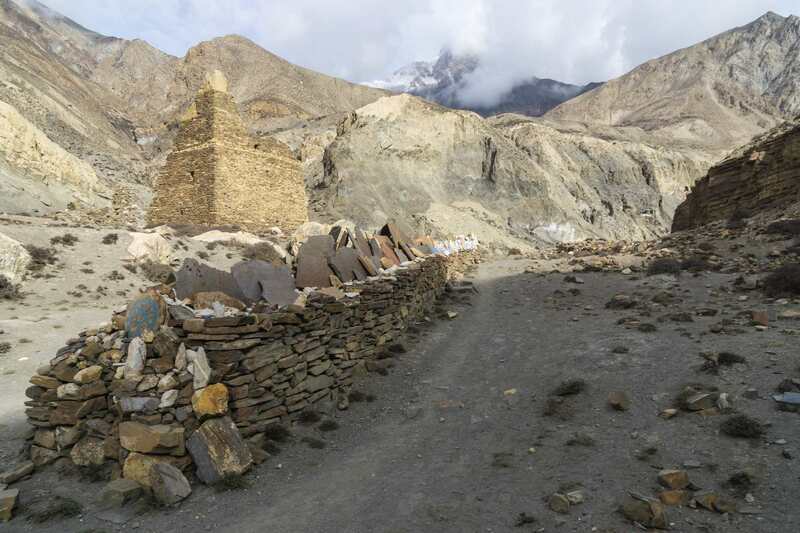 It was the arrival (mostly in upper Mustang but also in Dolpo and the Phu to Meta area) of Khampa guerrilla fighters who had fled Tibet in the 1960’s after an unsuccessful revolt against the Chinese People’s Liberation Army. 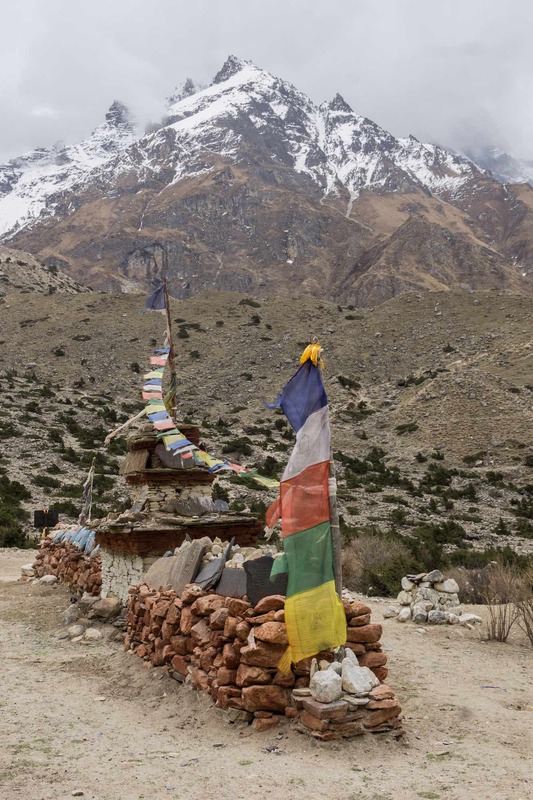 More than 1000 kilometers from their eastern Tibet homeland, they used their new bases in Nepal to conduct raids against PLA posts and convoys in Tibet. Eventually, the Chinese officials exerted enough pressure on Nepal to dismantle the Khampa resistance. 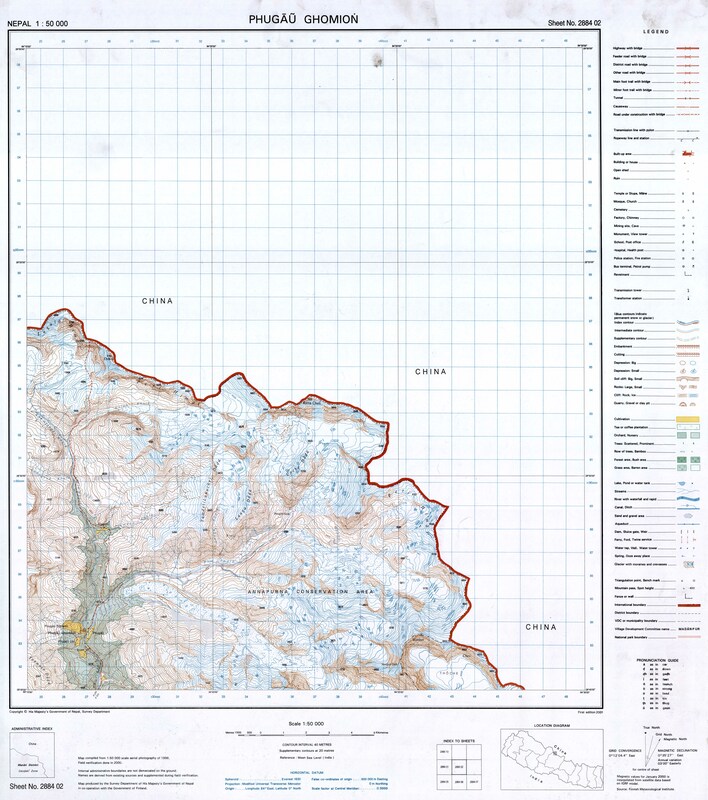 Thanks in part to the Dalai Lama’s personal intervention, as well as the CIA’s decision to pull the plug on Operation Shadow Circus and their support of the Khampas, the Khampas gave up the fight and were moved to refugee camps in Pokhara and Kathmandu. 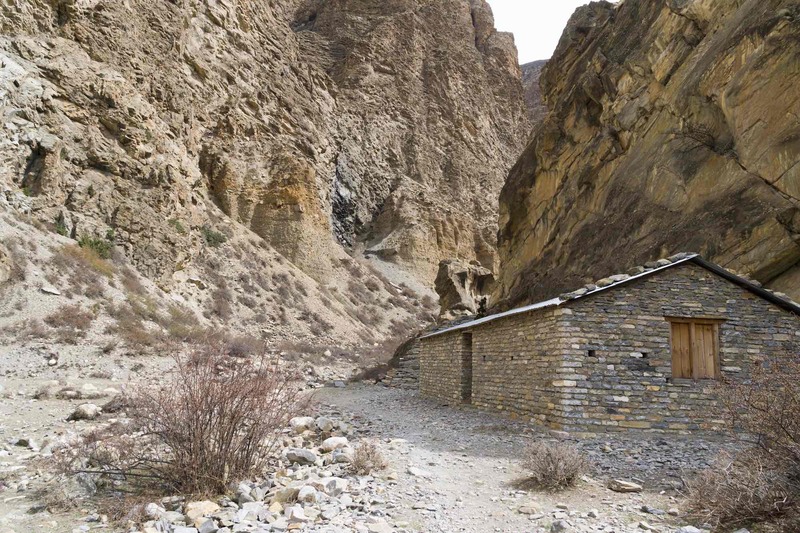 We continued upstream and by evening reached another deserted village, known as Kyang, where we resolved to spend the night. We clambered through the empty broken houses, cutting through the tall weeds that grew in the courtyards, until we found one that would offer us sufficient shelter. 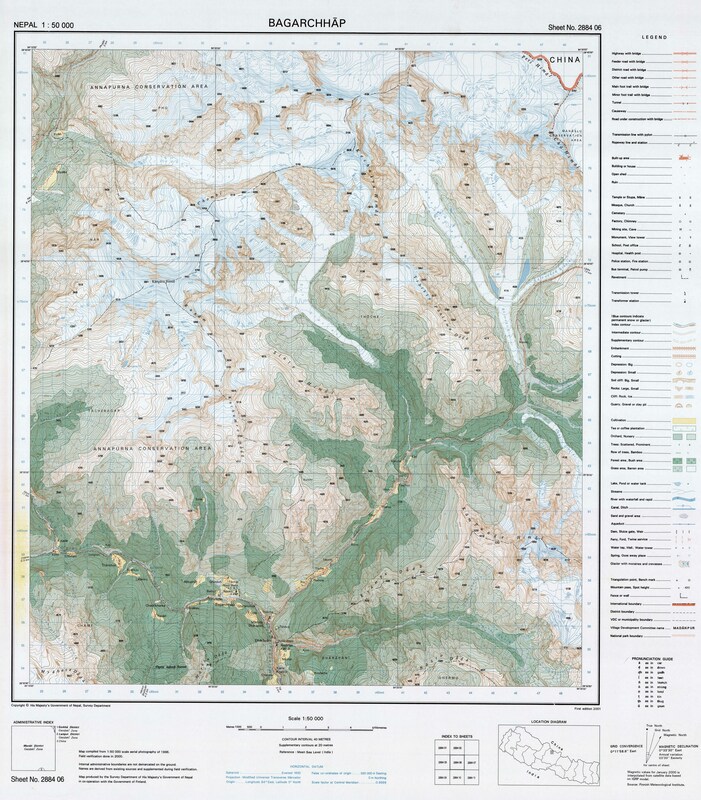 So – even before the mid-1950’s the village had been abandoned. So much for my attempt to explain it as a result of China’s sealing of the border in the 1950’s! 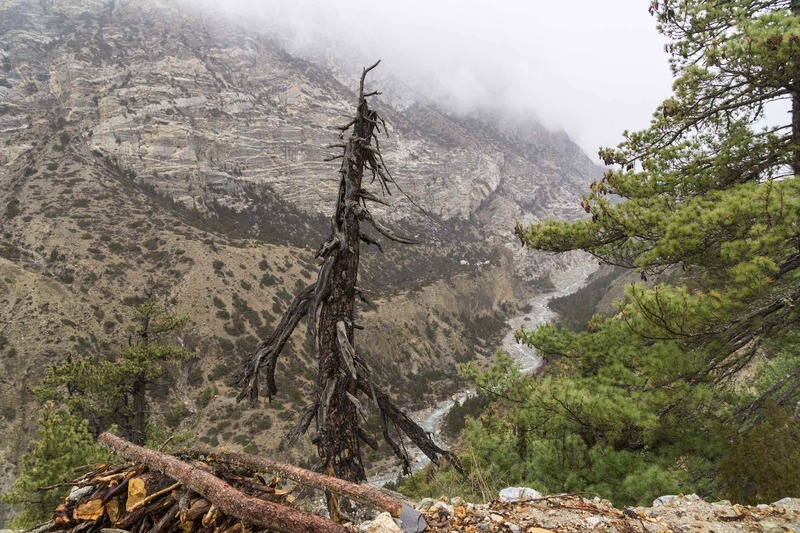 His description does make sense of one thing – that is, how the Khampa resistance group was able to just move into a settlement. What they had found was an abandoned one and made it theirs. 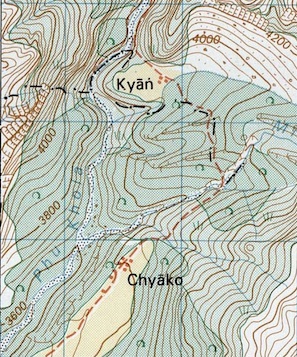 Now Kyang is identified on the signage as a Khampa settlement, even if they only lived there for a decade or so. 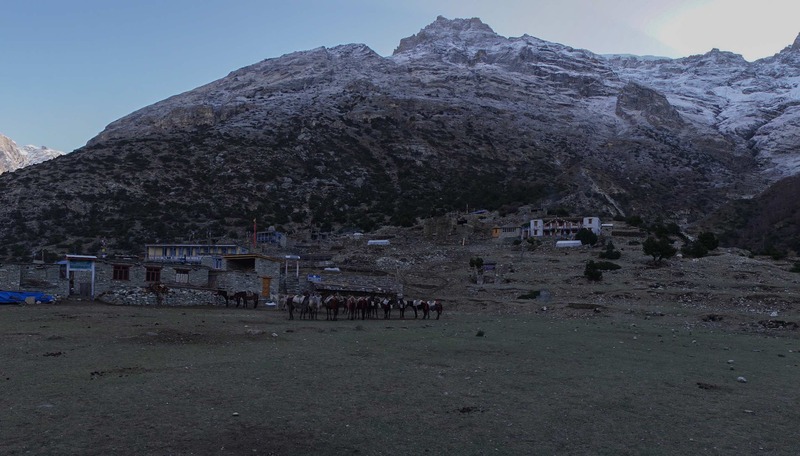 The photo below taken from the south after we left Kyang shows a couple of new buildings – guesthouses with brightly coloured corrugated tin roofs – to the south of the village’s older buildings. Our guides did chat briefly with a herder and his wife who live in one of them. 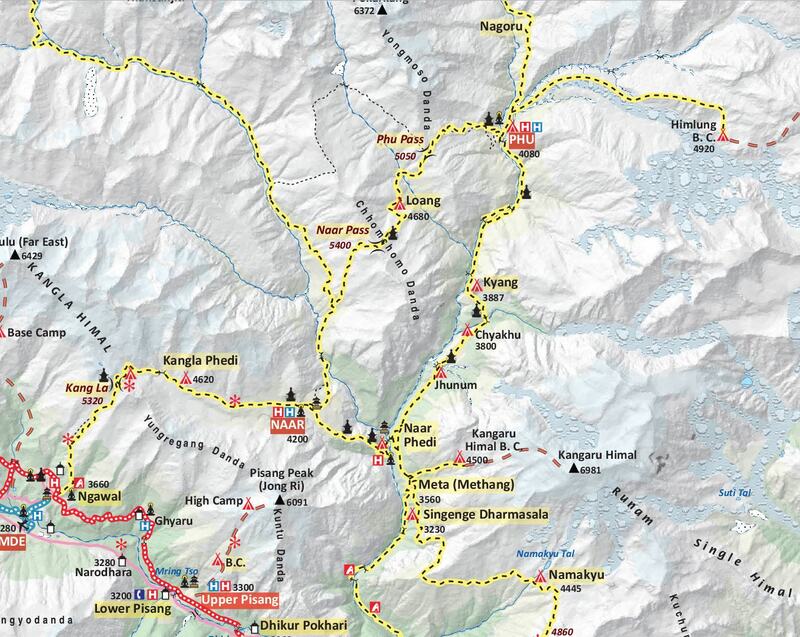 As this Nepal Govt topo makes clear, there is a bit of a climb as you leave Kyang for Chyakhu. 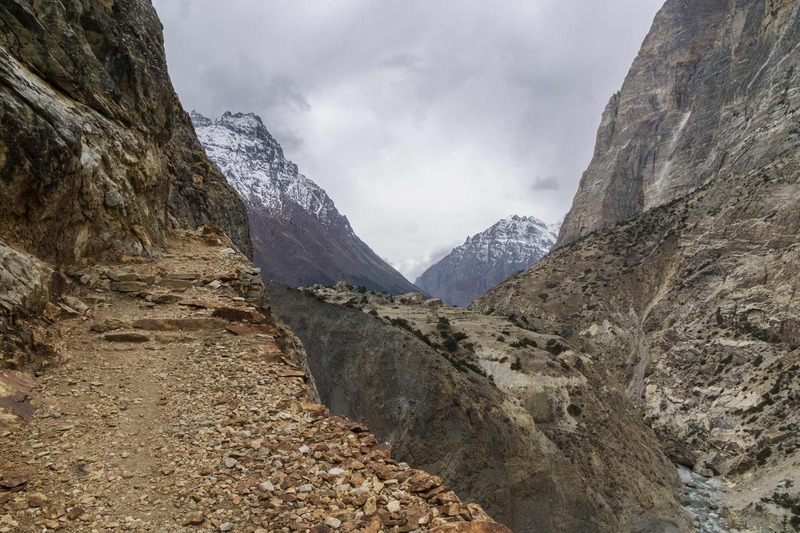 Fifteen minutes up the trail I turned back for a last shot of Kyang (the photo above). 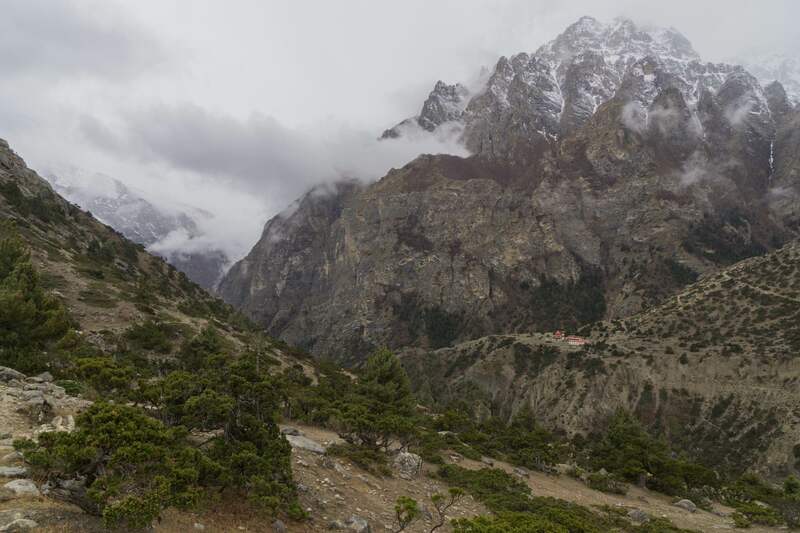 Then we went down on the other side of the ridge and crossed a stream before heading on mostly flat (“Nepali flat” our guides would say and chuckle) to Chyakhu. 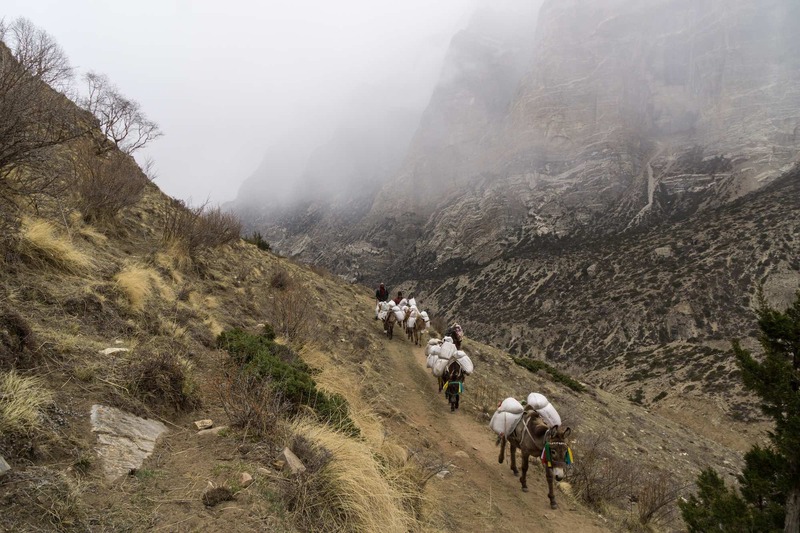 Ten minutes after stepping aside from the trail to let a donkey train pass by, we came to the settlement of Chyakhu, once (and maybe still!) a traditional winter settlement for Phu inhabitants. 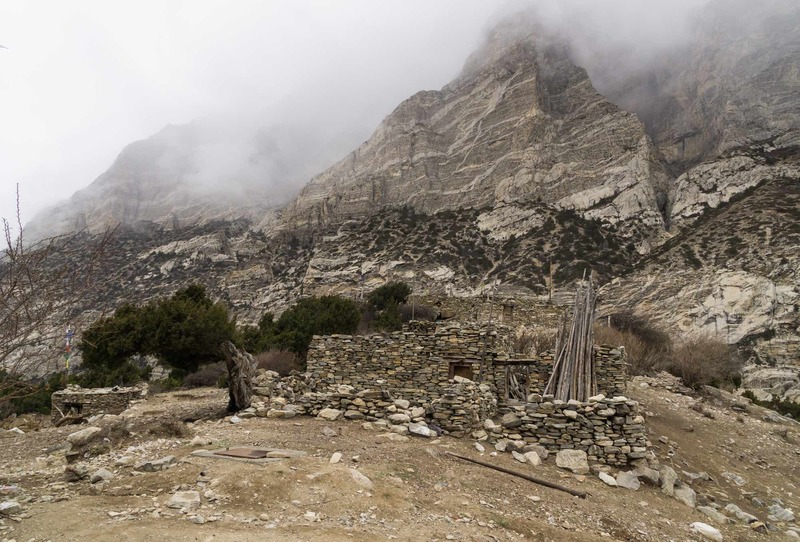 While many of the old stone structures look like they have been abandoned, there are in 2018 also new buildings – in particular, guesthouses – being built. 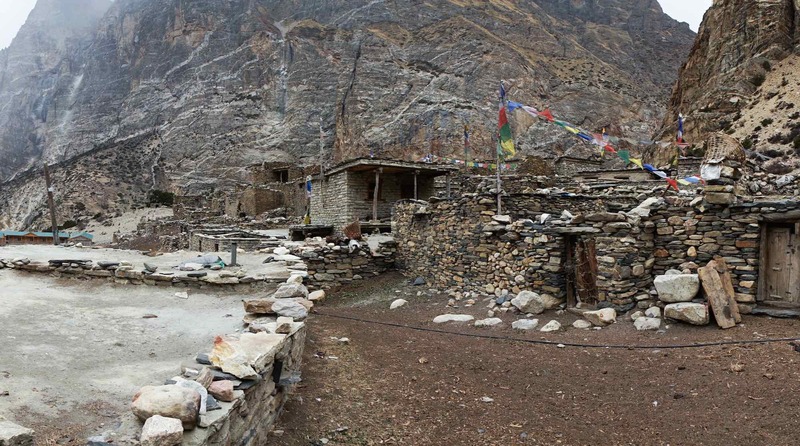 As with Khyang up-valley, this settlement is now graced with a sign identifying it as a Khampa settlement. Given that the Khampas – and other Tibetan refugees – would only have moved in after the 1950’s and then moved out in the mid-1970’s to refugee camps in Kathmandu and Pokhara, there is much more history here than the sign indicates. It was noon and this was our lunch stop. We made use of the dining hall of a guesthouse (on this day it was the unpainted wood building in the image below). Our cook team readied the food, using some of the guesthouse facilities. 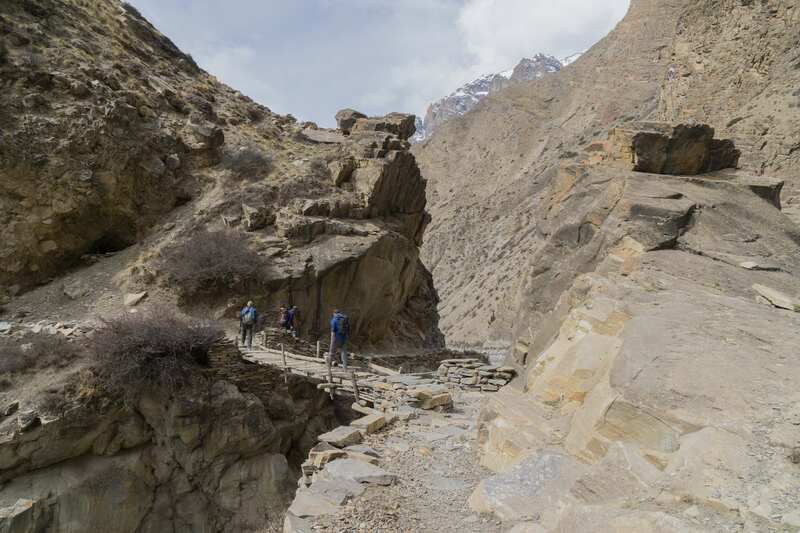 Not only did we get a surprisingly varied range of excellent meals but the attention to hygiene was such that only one person had any gastrointestinal issues during the 19 days on trek – and that was likely not the result of the food. Further downstream high up on the opposite bank one sees a deserted village of some fifteen houses. [He is describing Meta or Methang here.] Crossing the trembling bridge, we followed the path up the far bank. After walking for about two hours, we came to another small group of deserted houses, known as Dzu-nam. 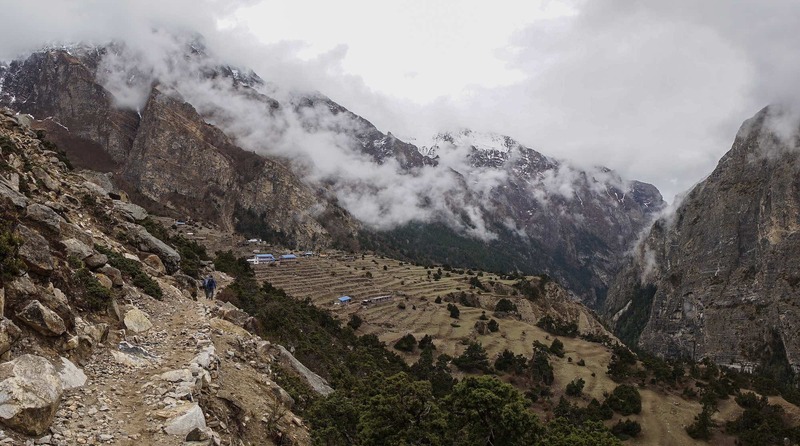 Further south from Jhunam as we neared Nar Phedi we got some nice views down the valley from our trail on the east side of the Phu Khola. Somehow the mist added to the magic! 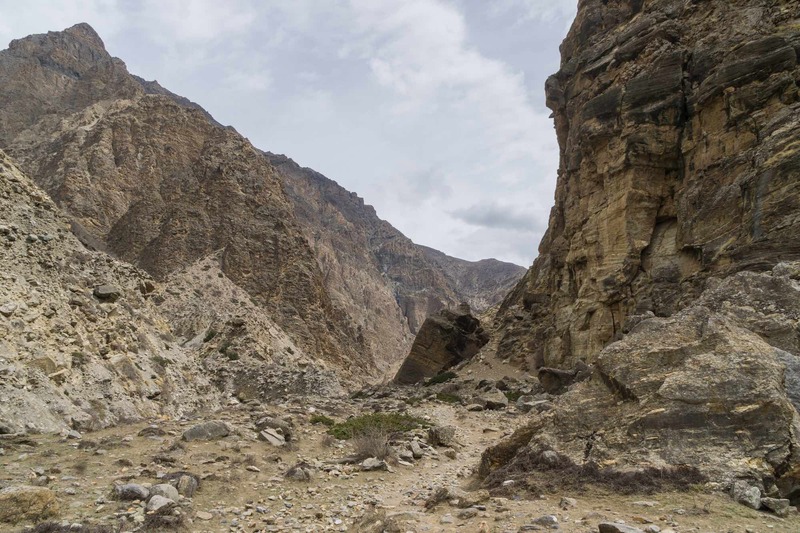 Around the corner in the image above is the dramatic setting of the Nar Phedi Monastery (the Lonely Planet guide-book identifies it as the Narsadak Changu Tashi Choling Gompa). It is a new complex, having been built in the last ten years with the funding coming from outside the local communities. 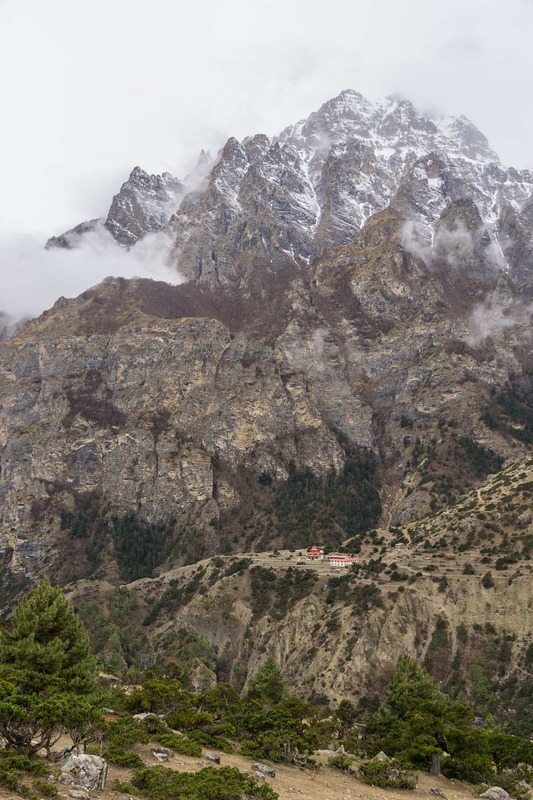 It now includes a lodge for the monastery’s guests, as well as for trekkers. 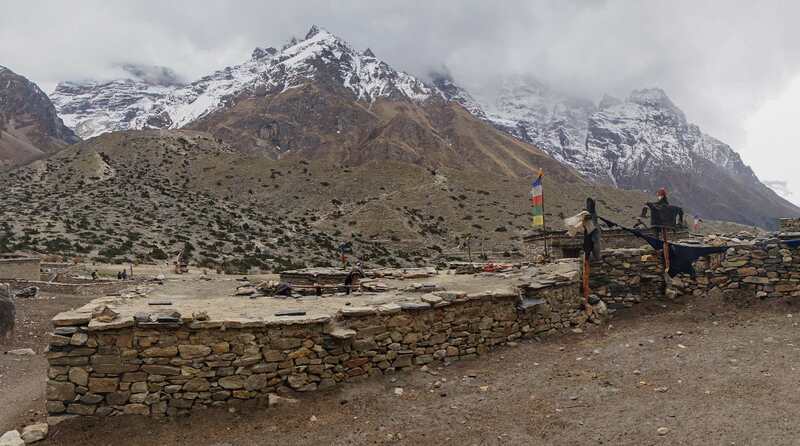 A number of Nar-Phu trek itineraries stop there for a night before moving on to Naar, another 500 meters up, the next morning. 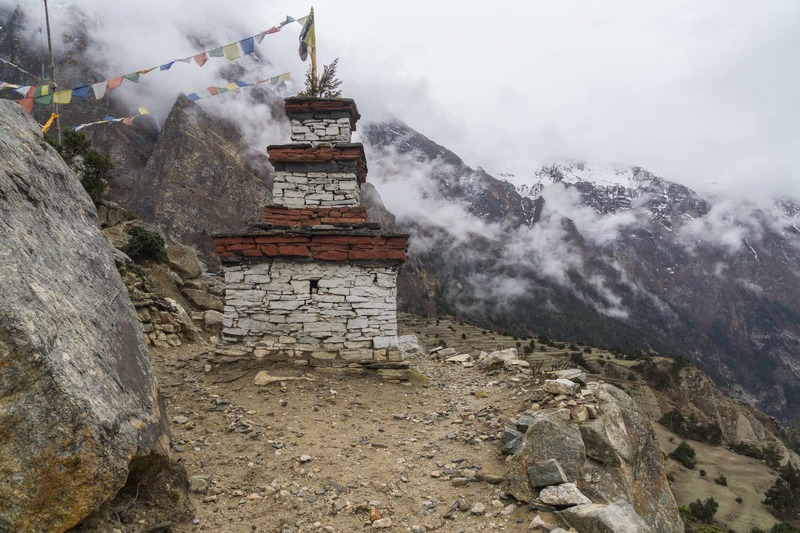 We stayed on the east side trail and soon were approaching the kani (village entrance chorten) you see below. 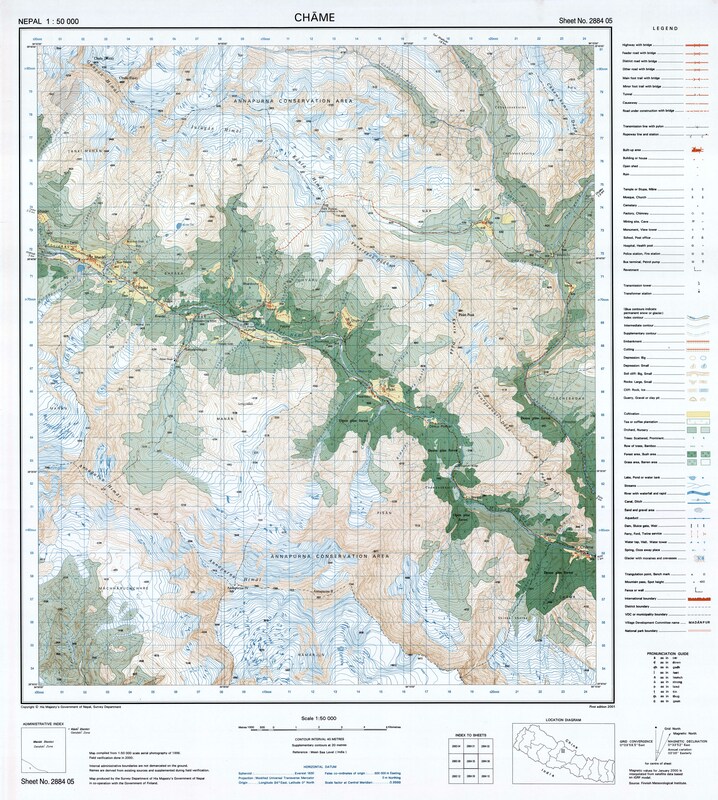 Meta (also appears as Metta and Methang) is just to the south of the junction where the trail across the Phu Khola takes you west to Naar past the monastery you see on the west side of the river in the images above. Below is a view of the winter settlement of Nar and Phu villagers taken the next morning just before we set off for Koto. In early May 2018, there were three or four guesthouses available, including the new Hotel Marpa International pictured below to the right of center. The next day as we walked down to Koto we would see yet more new guesthouses being built or just opened. 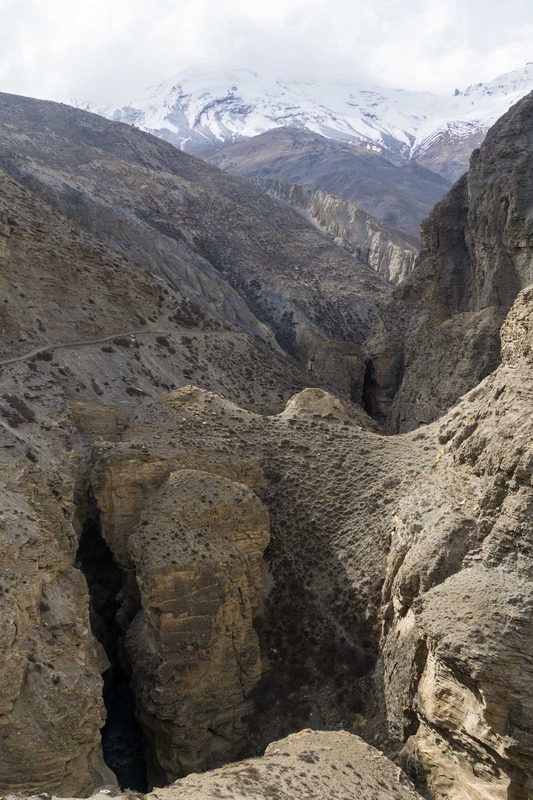 Perhaps locals are hoping that the positive reviews of their valley as a trekking destination will lead to more visitors. 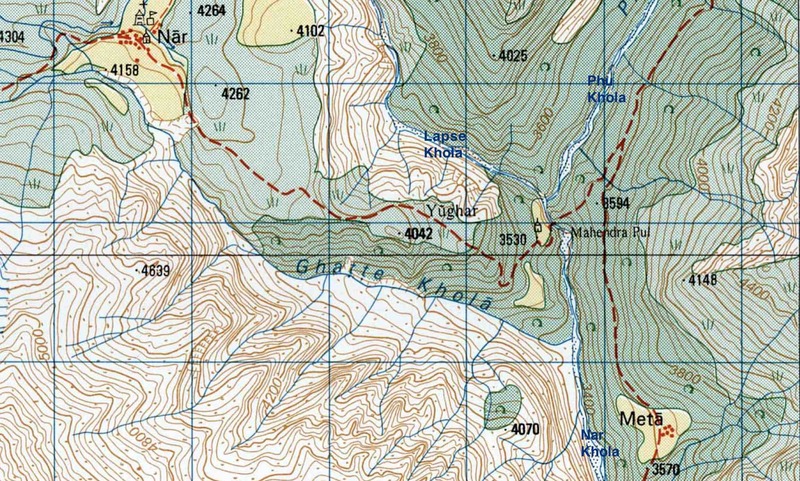 The next day at Koto, I would ask the official at the checkpoint how many trekkers had set off for Meta that day. His answer: 7.